How can I shut down the PC after specified amount of time? How would you go about turning you computer after a specified amount of time? I listen music before I go to sleep and would like to be able to shutdown my computer after a specified amount of time. After ½ an hour say. It would be cool if you could connect a desktop shortcut to a task in scheduler so you click the shortcut and ½ an hour later it shuts down. The original recommendation - TimeComX, is now only found on shared hosting sites and has been discontinued. The computer will shutdown 30 minutes (1800 seconds) after running the batch file. Or put that in its own separate batch file, then run it to cancel a shutdown. 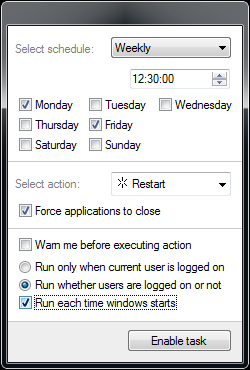 Open the Run window (Windows Key+R) or (Start / All Programs / Accessories / Run). Click on OK and your computer will turn off after the specified time (here 30 minutes). Go to Control Panel → Power Options → Change Plan Settings and change the Put the computer to sleep after option to whatever you want. 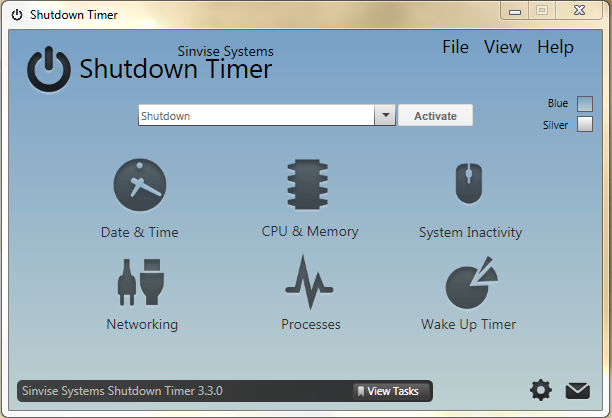 Shutdown Timer can do this for you, the free version meets your requirements. Save this file to your My Documents directory and name it Shutdown.bat (note the .bat extension and not .txt). Now, in Actions tab, click New start a program and brose for your .bat file. Click OK until it's saved! open start -> write cmd and open it. How can I make windows 8 shutdown automaticaly after a set amount of time? Is there a way of shutting down a Windows 7 computer after sleeping for X amount of time? Is it safe to shut down my PC right after intensive CPU/GPU load? Can I extend the timer on a delayed shutdown?